I would like to give a big thank you to Consumer Crafts for supplying the materials used in this project! With CA, ch 36. Join with a Sl st in furthest ch from hook to form a ring. Round 1: Beginning in same ch as join, *work 2 sc, work 1 sc in each of the next 5 sts, rep from * around, join and fasten off — 42 sts. Round 2: Join CB in same st as join, *work 1 sc, ch 1, skip next st, rep from * around, join and fasten off — 21 sts and 21 ch-sps. Round 3: Join CC in any ch-sp, ch 2 (counts as first hdc), work 2 hdc in same ch-sp, work 3 hdcs in next ch-sp and each ch-sp around, join and fasten off — 63 sts. Use CC to surface stitch around base of Round 1. With CC, ch 42. Join with a Sl st in furthest ch from hook to form a ring. Round 1: Beginning in same ch as join, *work 2 sc, work 1 sc in each of the next 6 sts, rep from * around, join and fasten off — 48 sts. Round 2: Join CB in same st as join, *work 1 sc, ch 1, skip next st, rep from * around, join and fasten off — 24 sts and 24 ch-sps. Round 3: Join CA in any ch-sp, ch 2 (counts as first hdc), work 2 hdc in same ch-sp, work 3 hdcs in next ch-sp and each ch-sp around, join and fasten off — 72 sts. Use CA to surface stitch around base of Round 1. With CC, ch 54. Join with a Sl st in furthest ch from hook to form a ring. Round 1: Beginning in same ch as join, *work 2 sc, work 1 sc in each of the next 8 sts, rep from * around, join and fasten off — 60 sts. Round 2: Join CC in same st as join, *work 1 sc, ch 1, skip next st, rep from * around, join and fasten off — 30 sts and 30 ch-sps. Round 3: Join CB in any ch-sp, ch 2 (counts as first hdc), work 2 hdc in same ch-sp, work 3 hdcs in next ch-sp and each ch-sp around, join and fasten off — 90 sts. Use CB to surface stitch around base of Round 1. 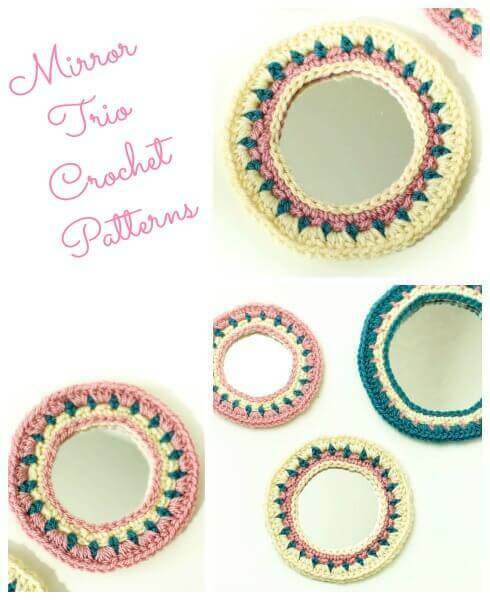 Using your glue gun, trace a thin line of glue around the outermost part of the mirror. 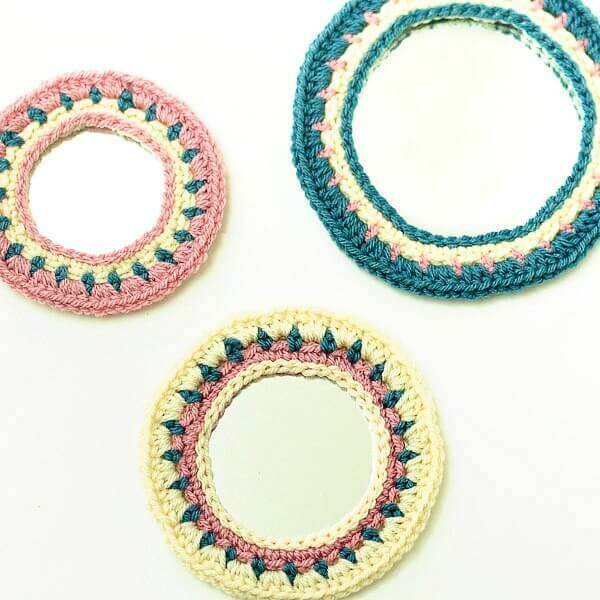 Carefully place the crochet border on the mirror and press gently into glue. That’s it! I used those velcro adhesive picture hangers to attach mine to the wall. Love them Kara 🙂 Well done! These are really cute! I love your color choice, thanks for sharing! Great idea! I think they will also make lovely photo frames, isn’t it?